Unconquerable landscape? Europeans in a foreign wilderness. Ausable Chasm. Photo by Gretel Schueller. The Ausable Chasm is a sandstone gorge and one of America’s oldest tourist attractions. The first European to record having seen it was William Gilliland, in 1765. Gilliland owned some 50,000 acres of land that extended between present day Crown Point and Cumberland Head. Much of his property remained uncharted at the time of the Revolution. Northern New York and Quebec was still a fairly primitive place in comparison to the cultivated fields of Europe. Settlements grew along the waterways where there was easy access to markets. The principal city was Quebec, but other large communities grew up on the St. Lawrence and Richelieu Rivers. The interior parts of the continent were primarily occupied by various tribes of Algonquian-speaking peoples and a hardy group of Europeans—soldiers, hunters, trappers, and traders—that lived in distant outposts on the frontiers. For European soldiers first arriving on this continent, there was a feeling as if they had entered a new world. The northern frontier was very different than the rest of the colonies. It had been occupied by the French since Samuel de Champlain founded New France and the City of Quebec in 1608. France ceded Quebec to the British at the end of the French and Indian War in 1763, but Quebec remained a culturally French city. When the colonies of New England rebelled, the British became concerned that the Canadians might also decide rise up against the British military government. 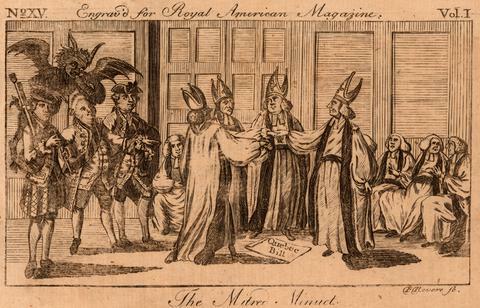 In an attempt to maintain peace in Canada, the British Parliament passed the Quebec Act of 1774. The act ended military rule and installed a permanent local government that gave French Canadians complete religious freedom and restored the French form of civil law. The Quebec Act helped sway the Canadians from joining the Rebel cause. Despite these concessions, tensions remained between the British and French Canadians. Religion was a fundamental reason for this divide. Despite their differences, the French Canadians and the British soldiers lived in peace. Most of the troops that were to take part in Burgoyne’s 1777 campaign had arrived the previous year and were part of Carleton’s 1776 campaign on Lake Champlain. About 8,000 regular troops were stationed between Quebec and Lake Champlain. The soldiers were kept busy drilling during the winter. This was partly to prepare them for a campaign in this wilderness, but also to keep them out of trouble. Without an enemy presence, the time in Canada was quiet. The soldiers enjoyed the modest comforts of a mild Canadian winter, but few of the soldiers were prepared for what lay ahead. They could modify their tactics in anticipation of wilderness combat, but surviving in this unforgiving landscape was something entirely different. The pests and peril were very real. Park after you cross the bridge over the Ausable Chasm–on either side of the road. Walk to the east side of the bridge for an impressive view of the chasm. Play track 4 while sitting in your car in the parking lot, or while exploring the chasm. 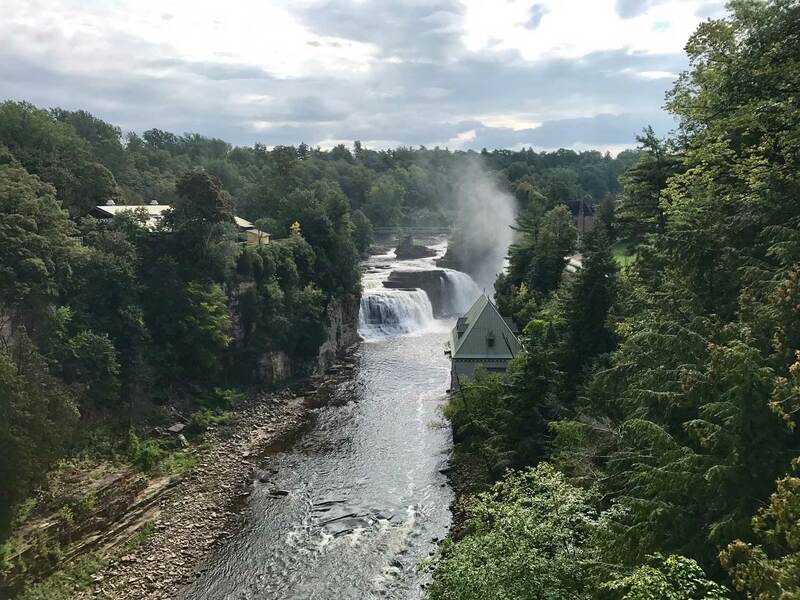 Touted as the “Grand Canyon of the Adirondacks,” Ausable Chasm offers a variety of recreational opportunities in the summer months—from walking trails to rock climbing, rafting, tubing, and camping. Visit www.ausablechasm.com for more information. Clover Mead Café: Authentic little farm-to-table café and farm store, featuring paninis, homemade sweets, and North Country Creamery’s famous cheeses and frozen yogurt. (Limited hours.) 933 Mace Chasm Rd, Keeseville, 1 mile from Ausable Chasm. North Country Club Restaurant A long-standing North Country institution for pizza. 1795 Rt. 9, Keeseville, 2 miles from Ausable Chasm. Mc Lean’s Family Restaurant Simple, home-style menu that includes Michigans, soups, and fried fish. 1847 Rt. 9, Keeseville, 2 miles from Ausable Chasm.